Even without meaning to, there are always reasons behind every action that we make. We might not be aware of them at the time, and sometimes it takes a lot of reflection to decipher our own mind’s intentions, but they’re there if you dwell on them long enough. Thinking about why I’m so passionate about writing and why I want to make it my life lead to a few reasons why I spend so much time holed up with a pen, a journal, my computer, and some music; why I write. I write to make sense. My thoughts are so often jumbled and disorganized and don’t make a single drop of sense. However, when I get those thoughts and emotions out on paper, everything makes a little more sense. When I can re-read my thoughts, I can find motives and reasons behind actions. I write to remember. I make the same mistakes over and over and over again. I feel like I’ve fallen in love with the same person three different times, but writing down all the experiences the last time around has helped me keep a more practical view. My memory hasn’t been the same after a hit to the head several years ago, and writing keeps me on track. I write to inspire. I’m not good at a lot of things. In fact, I’m pretty terrible at most things. The one thing I’m good at is writing to be relatable. In everything I write, I want people that might be struggling to know that they aren’t alone. I want people to feel like they can conquer their demons because I’m doing an okay job at that through writing. I write for therapy. I write because putting my hurt into words helps to remove myself from a bit of the pain. There’s something wonderful in the healing process of looking back to when the pain was fresh and seeing how you’ve made it through the worst parts. I write because I have to. I write because if I don’t, I get incredibly irritable and cranky. I get frustrated and rude. I get so emotional, but when I finally get that pen and paper back out, the bad feelings just flood out of me and I feel peace and contentment again. I write to keep myself sane. Seeing all of those notebooks makes my writing heart smile! Words are so wonderful – they soothe you, they cheer you up, they let you get your sadness/rage out. 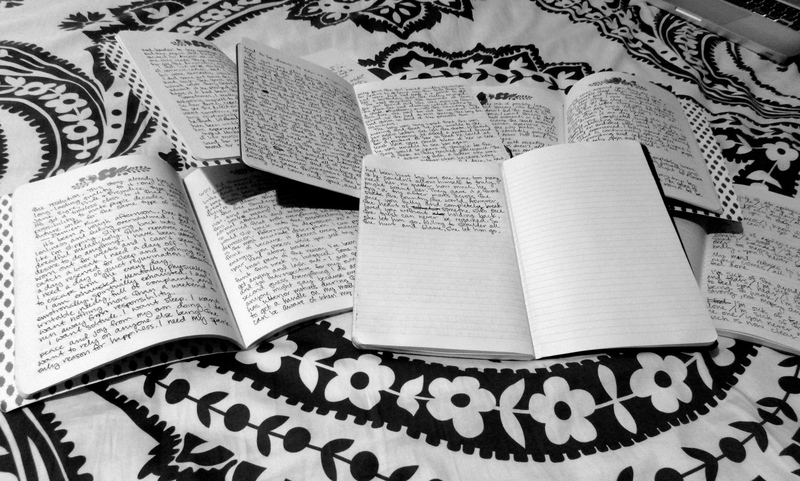 I can’t imagine my life without writing! And I’m so glad that it is your passion, too. I think we write because we can’t NOT write. :) Double neg for the win.